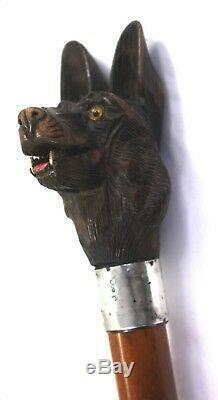 Black Forest Carved German Shepherd Walking Stick-1904. 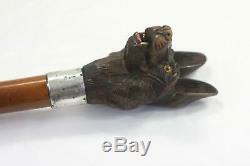 Excellent carving of a German Shepherd mounted on half high ridge Malacca shaft with base metal ferrule. 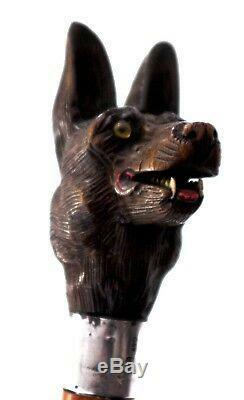 Large good quality carving of a German Shepherd with glass eyes. Silver collar holding the Assay punches for London 1904. Condition: Carving of the German Shepherd is beautiful without breaks. Silver collar evidence of wear. Malacca shaft good without breaks or cracks. Length to top of ears: 89cm. 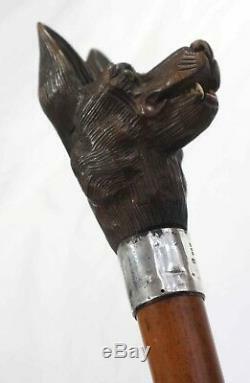 The item "Black Forest Carved German Shepherd Walking Stick-1904" is in sale since Monday, September 3, 2018. This item is in the category "Antiques\Woodenware\Walking Sticks/Canes".